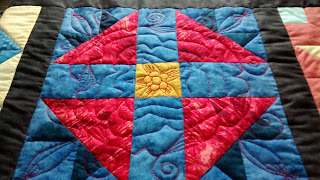 Have you ever done some free motion quilting that you felt ruined the whole quilt? I did, and because of it I tucked my nearly finished quilt away into a closet for about a year. I didn't know how to deal with it. I was happy with most of the quilt but I thought the free motion quilting I did on one block was ugly. My eyes kept going there and nowhere else on the quilt. I had already picked out a portion of it once before and improved it somewhat, but I still didn't like it. Today I decided it was now or never. I had to pick out all of my free motion quilting on this block or I would never finish this quilt. It actually went quite well. I am almost done. It took me a few hours, but I think it was worth it. I was very careful not to make any holes in the fabric. That was my worst fear. Tomorrow I will finish picking the last little bit, and then I can get back to free motion quilting this quilt and finally get it finished. See the lovely pile of thread I picked out?